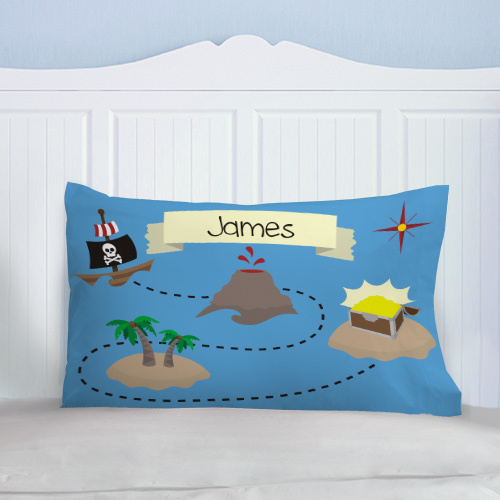 Adventurous nights sailing the seven seas are sure to be had when he snuggles up to one of these super soft Pirate Personalized Pillowcases. Your Personalized Pirate Treasure Map Youth Pillow is a 100% Polyester White Pillowcase and measures 12" x 18". Pillowcase comes with our standard Travel/Youth size pillow and is machine washable. Includes FREE Personalization! We will personalize your Youth Pirate Pillowcase with any name. Please Note: Our Pirate Map Pillowcase is printed with the design on one side and is white on the back. Outfit his entire room with our fun Pirate Gifts. He will also enjoy our Personalized Pirate Doormat & our Embroidered Pirate Lunch Box as well. For all Custom Pillowcase Gift Ideas, always think GiftsForYouNow.com.